The now-famous video commercial was shot in Russia over the course of just three days. The Russian beer brand Sibirskaya Korona recently released an internet video of its latest commercial, which instantly went viral and has now clocked more than 8 million hits on YouTube. The ad centers on actor David Duchovny, whose ancestors came from the Russian empire. He tells Russians that they have reason to be proud of their country. Firstly, the actor, having read the script, introduced some changes to it. For example, Duchovny refused to take a Russian banya (steam bath). "Imagine a storyline in which a naked man is sweating in a banya. I don't think David got a clear idea of what it was about, how people do it and why. Generally, few foreigners can understand the Russian banya," says the producer of the commercial, Mishel Sheniara. Some other scenes had to be dropped too, for legal reasons. The creative team behind the video wanted to use Olympic symbols in the ad. They asked themselves: What can a person living in modern Russia can be proud of? The option of using Sochi 2014 was not viable because of the ban on using Olympic symbols in advertising. The authors then considered adding a storyline based around the technical glitch that occurred at the Sochi Games opening ceremony when one of the Olympic rings failed to open - after all, four rings is not an Olympic logo. The creators of the video invented a scene in which David wakes up in the middle of the night terrified by a nightmare he has just had in which the fifth ring fails to open. However, the lawyers ruled out that scene too since it was also impossible to use archived Olympic footage. The production team came up against other difficulties too. They had a lot of trouble getting permission to film the skyscrapers of the Moscow City business center: its unique architecture is copyright-protected. In addition, there is a ban in Russia on using state symbols for commercial purposes. That is why in the icebreaker scene, we see David waving an imaginary flag with a map of Russia depicted on it. Ice-hockey players' uniforms, the cosmonaut's spacesuit… state symbols were removed from everywhere. Things didn’t get much easier when it came to the music – it took a very long time to get permission to use the song ‘Povorot’ by the rock group Mashina Vremeni (Time Machine). "The moment they heard the word ‘beer’, they shut the door in our face. Theaters did not want to cooperate with us for the same reason," says the producer. According to him, Duchovny also refused to try Sibirskaya Korona on set. However, in his free time he did manage to visit a couple of Moscow clubs and restaurants. Once, during urgent filming, David was surrounded by a crowd of female fans in the street. "David could not deny them a bit of his time, but it was me who was more irritated at that," says the producer, who would have had to pay a fortune to the star for any minute of overtime. However, Sheniara continues, one day Duchovny gave the crew a couple of extra hours for filming on top of the schedule. That happened when the crew went on location to film the actor in the countryside, where a curious incident took place, quite ‘in Russian style’. As Duchovny was striding across the Russian fields, the film crew were suddenly joined by a group of amateur ‘actors’. Sheniara describes a curious epilogue to the story: At some point a dog detached itself from the herd and approached David, who stretched out his hand to it. “The dog sniffed it, gave him an absolutely human look, as if recognizing David for one of its own, and began to drive the cows in the opposite direction," he says. The biggest difficulty that the American actor had in transforming himself into a Russian was the language. 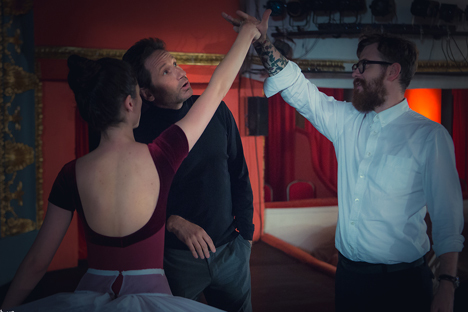 According to the production team, Duchovny struggled for a long time with pronouncing the verses and the lyrics to the song in the video. To make things easier for the actor, his Russian text was transliterated into English script and held in front of him all the time. However, the actor was still not satisfied with his pronunciation and promised the crew that he would learn to speak like a Russian. After returning to New York, Duchovny kept his word and re-recorded his parts in Russian. It is this improved version that we hear in the final version of the video, when the actor confesses his love for the Russian forests, rivers, and blue skies, albeit with an American accent.